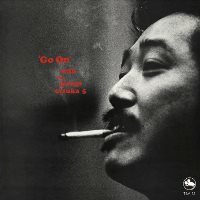 Go On was drummer George Otsuka's first album for the Three Blind Mice label. The established leader went into the famed Aoi Studio with his regular quintet at the time, featuring the young and brilliant trumpeter Shunzo Ohno and saxophonist Mabumi Yamaguchi. The program opens with Ohno's original title track which vividly reminds us of the hard bop sound, with a hint of modal approach, of Art Blakey's Jazz Messengers when Wayne Shorter was a member. The song is attractive, powerful and features a wonderful solo by Ohno who has beautiful tone and great technique. Yamaguchi burns on the saxophone in his own composition "Space Drive" and Joe Henderson's "Isotope." Overall, this is a very nice straight-ahead jazz album by a fantastic group. Produced by Takeshi Fujii. Recorded at Aoi Studio in Tokyo on November 28 and 29, 1972. Blu-spec CD is compatible with all regular CD players. Paper sleeve special limited edition.